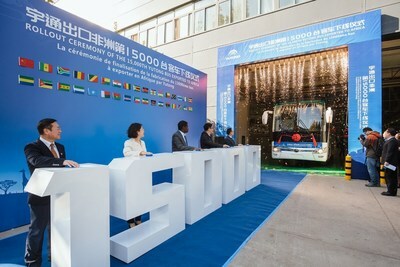 ZHENGZHOU, China, Nov. 23, 2018 /PRNewswire/ — Zhengzhou Yutong Bus Co., Ltd. (600066:CH) (Yutong Bus or “the Company”), the world’s leading bus supplier, has produced its 15,000th bus to be delivered to Africa at its factory in Zhengzhou, Henan Province. 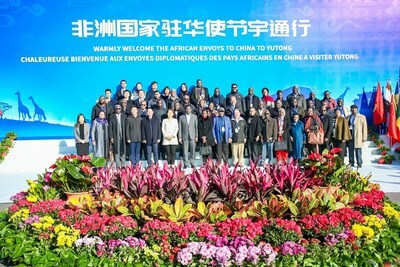 The Minister from Ethiopia and representatives from over 30 African countries’ embassies, including South Africa, Nigeria and Congo, visited the plant to witness the bus rolling out of the factory and praise Yutong Bus for its support of transportation development across the continent. The bus to be delivered to Africa is one of Yutong Bus’ most recent models, the ZK6122H9. Since entering the market in 2004, Yutong Bus has been the top Chinese bus exporter to Africa. Over the past three years, the Company’s exports to Africa have accounted for 45% of China’s total bus exports to the continent. The Company has established a comprehensive sales and service network in nearly 50 African countries including South Africa, Ethiopia, Nigeria, Tanzania, Angola, Ghana and Algeria. It also supports factories in Nigeria and Ethiopia, bringing technical and talent support to local workers, providing a foundation for the local automotive industry and helping diversify economic development. In 2017, Yutong saw a total sale of 67,568 large- and medium-sized buses including 24,865 new-energy buses. It has become the world-leading new-energy bus maker with international recognition, successfully entering the markets in the United Kingdom, France, Chile, Bulgaria, Iceland and Macao in China. Zhengzhou Yutong Bus Co., Ltd. (600066.CH) (Yutong Bus) is a modern manufacturing company specialized in the R&D, manufacturing and sales of buses, with annual sales of 67,568 units and over 100,000 new energy buses delivered to date. The first company in China’s bus industry to list on equity markets, Yutong Bus recorded turnover of 33.2 billion yuan in 2017. Yutong Bus sells buses in over 30 countries across six continents with a market share of over 30% in China and over 15% globally. For more information, please visit http://en.yutong.com/.